Simpleology 5 is finally here. Without question, this is our most significant release yet. It’s built upon the 4.0 platform, but the new training and certification system we’ve built for it is, well … a revolution. We have already begun to send out upgrade invitations and will keep sending them at a pace the system can handle – making improvements as we go. Meanwhile, here are a few peeks to prepare you for what’s in store. If you are concerned about having to learn a new system, don’t worry. There are no significant changes to the 4.0 interface. What we’ve built on top of it will actually make the system even easier. There is much more to this formula than meets the eye, and we’ll be talking about this in more detail in the coming months. But know that this can be applied to virtually anything. Ever since we retired our courseware programs, there has always been an education gap at Simpleology. This was partly by design. The plan has always been to replace it with something far better and that day has finally arrived. Let’s face it – if you’re not doing Start My Day on a regular basis, you’re not getting the full benefit of Simpleology. A major component of version 5 is stick. Your habits define who you are. And for habits to mean anything they need to stick. Since Start My Day is the single most important foundational habit you can acquire, we’ve added a “streak tracker” to keep track of how often you’re doing Start My Day. You simply set how many days per week you want to do Start My Day (we recommend 5, but it’s up to you), and we show you a great big red line to represent your streak. When you break the streak, so breaks the red line. 5. When in Doubt? Do Today’s Training! Forget the rest of this blog post. Forget everything else we’ve ever taught you. Just log in … Click the “Do Today’s Training” button once a day … And we’ll take it from there. It really (finally) is that simple now. Woah. This is elegant Mark. I’m really impressed at the upgrade, and can see myself using this on a regular basis. Now I’m off to finish exploring everything inside Simpleology 5. Thanks for putting this together. Awesome stuff. Very nice set up and going through the training is a breeze. Great how you break it all down and make it so, well, simple…. Where do I begin? I was so blown away by what Mark is doing that I was speechless! For those that know me, they know that’s almost impossible to do. The interface is clean, easy to navigate, and has all the tools you need to stay on track with all your goals. My favorite tool is the ongoing tasks, which is something I will use a lot because I have things I like to be reminded to do every day. Another feature I liked is the button for the day’s training. This is a convenient reminder and access to keep you on track and constantly learning so you get the most from the system. The upgrade to Elite is dirt cheap, comes with a free trial, and gives you access to everything Mark offers. To say that this offer is amazing is the equivalent of saying the Eiffel tower is just another tower. I cannot wait to dig into this part of the site because it will take me to the next level in my marketing, and it’s a place I am now ready to go. Having already taken several of Mark’s courses, including the blogging course, I can tell you that they are all top notch. Mark doesn’t teach tricks or here today and gone tomorrow strategies. He teaches stuff that just plain works, and it’s all simplicity itself. I took the upgrade. Mark, you are stuck with me. I’m so excited about this I just can’t stand it. That’s why this will be a program that I recommend for years to come, and I’ll be recommending it in my new report I have coming out in a few weeks. I intend to take what you have taught about viral marketing, and you are the best at it, and apply it to my work! Thank you! Thank you! Thank you! It is so obvious to me that you embrace the 7 Army Values in everything you do, and you always overdeliver. You are one of the most generous human beings I have ever known, and it is both and honor and a privilege to call you Brother! Can’t wait to see you top this one because this is definitely the best Simpleology EVER! Keep doing what you are doing! Having trouble harnessing your ADD? There’s an app for that! Actually a site, built in functional fashion with an engaging interface that keeps you coming back for more! My #1 Favorite Business/Life Productivity tool! Check it out and see what I mean! Okay. So I’ve been using Simpleology for years (think only 101 with paper start my day). Sitting through the new training I learned a couple of things that make this software UNBELIEVABLE. The traditional start my day is just as awesome as ever. However what I did not know, was that I could use Simpleology to delegate items DIRECTLY to my team as long as they have a Simpleology account while completing Start My Day. HOW COOL IS THAT?!? !I’ve traditionally scheduled all of my “schedule” items in a paper planner, but am probably going to opt out of that for either Outlook, or GMail for the simple sake of being able to share with my team and I can type much quicker than I can write. Beyond this, the old courseware contained some great information and I personally loved it. The new teaching methodology is EXTREMELY interactive which will provide an additional level of stickability. Because it is so interactive I see myself being able to understand all that Simpleology has to offer, and more importantly USE all it has to offer as opposed to ONLY using what I know and am comfortable with.All in all, super excited for the new platform. Mark you and your team have outdone yourselves. Way to go. Love 5.0! Looking forward to becoming a black belt and building habits. I love how there are rewards to achieving higher levels, this is quite a breakthrough in achievement and personal development. Very motivating. Thanks Mark! Boyaka Da Kine Ya Buah! Congratulations on making it easier for me and many other folks to be more productive. I can see my dream of mastering productivity in the Simpleology Training Dojo from No Belt through to Black Belt with Sensei guiding me enjoyable, fun and super-simple. Churr, Tu Meke . . . I love it! It’s a whole lot easier guys. Mark really streamlined the process and the new training really gets you up to speed. Awesome stuff! I have always enjoyed Simpleology and reading/watching Mark’s products. Mark’s vision has always been much more dynamic than the 2D versions of the past. The past products have been nice, yet truthfully – I did not feel that the earlier versions of Simpleology GOT the dynamics down to a seamless flow. Version 4 took a big step and now Version 5…this version flows like silk! From the point of brainstorming ideas to actually doing something productive – this tool makes you press and mold your ideas. Before V5, ideas were somewhat elusive and could easily turn into something else you forgot or wanted to do (when you get time). Now, you are guided to record and make decisions needed to PRODUCE. After testing V5 – somehow Mark has been able to overcome linear limitations of the past.. This tool will teach you habits that achieve greatness. I am very excited about the power and changes to come by upgrading my thinking and the actions I take on a daily basis. Time to turn chaos into simple. Absolutely loving the new Daily training/Black belt dojo feature. Awesome! !can’t wait for the new version! Ps would love to have how to tutorial videos like those you had before.they really help understand and make most of ne/tweaked features. An ipad app would be welcome too. I always saw the value in Simpleology but it never stuck with me. In the early versions I thought the courseware and the software were too separate and I skipped S4 altogether because I didn’t know what was happening without the training. Now I can finally get going immediately, being educated as I go. Great stuff! There are IPad bugs that need to be worked out and as of now I’m stuck with using S5 on laptop. If the team could get it fully mobile-integrated that would be bliss! For now though I’m excited, I chose the 60 day Elite trial which is more than enough time to see if it pays for itself. @frankmullen Hey Frank, the iPad bugs have been ironed out :-)Some more interesting mobile integration coming very soon! @Mark Joyner Great I’m seeing changes happening every day so can’t wait to see where you’re going with it! Wow is all I can say! Well I will say a lot more than that: The changes made to Simpleology v5 are great! It’s like having the best productivity coach / trainer looking constantly over your shoulder and motivating you to work and keeping you on track. When you work in training mode, and use the library/dojo, it’s like having Mark Joyner himself (one of the best, if not *the* best, productivity coaches around, in my opinion) right there in the room with you, on demand! One great new feature is the new coloured belt system (like the belts used in martial arts to show progress and skill). This gets right into your brain on a deep psychological level to help keep you motivated and on track. This is perfect for me as a long-time gamer—it makes being productive just like playing a game (and thus fun!) as you try to progress to the higher levels (which is not difficult, of course)! If you are an inveterate diverter onto multiple tangents (like I can be) this will be essential. As usual, Mark Joyner has exceeded all expectations and leaves us wondering (again) what he will do next! We will see soon enough, I’m sure! Roll on version 6! I’ve been with Simpleology since the start and loved the training. When the dreamcatcher and daily targets first came on the scene, I didn’t click with the interface. Recently, I’ve been looking for a way I can dump everything in my brain and select a few things to really focus on while making sure I don’t lose track of everything else, and I can instantly save out new ideas that pop into my head. It was a large list of requirements, and I was trying to make a lot of square pegs fit. Then along comes v5 and I decide to give it a whirl. It has everything I need, and the interface has been refined and polished to the point where it’s exactly what I want in a way that I want it. effortlessly. Mark you have really done a great job with this update! Thanks for including me in the sneak peak! Now i completely understand what is meant with Habit Bombs. And let me say it loud: I LOVE IT EVEN THOUGH IT IS THE FIRST TIME I USE IT. I like the idea with belts. Bringing some gamification to productivity is an outstanding idea. I like the training very much. So you don’t try figuring out the system, you will be taken by the hand and shown the place till you know each and every corner. I like the fact that you need to make the stuff over and over again till you get to a higher belt. It is the only way to turn a behaviour into habit. I like the library, there are lots of gems over there. All in all 5.0 brings lots of stuff to discover but the most important fact is it brings productivity to the next level. Thanks to the Simpleology team for this succesfull update. Thank you for allowing me an early start to Simpleology 5. I have been with the system since the early days, as a free member, at an unfortunate and messy time in my life. Very slowly did my journey progress till recently I became an Elite member and sank my teeth into the (legacy) coursework and became more knowledgeable and better equiped to understand the benifits. Then came Simpleology 4, and by using it almost every day my negative attitude has changed and my self limiting and destructive habits are slowly becoming a thing of the past. Simpleology 5 has truly impressed and excited me to wholly absorb myself in the system and it’s training. Since the beginning Simpleology has slowly but surely changed my lifestyle, attitude and ability to start achieving long held dreams/goals/targets. Simpleology is a lot more than just a productivity booster. It can improve so many other aspects of yourself and your abilities and lifestyle. It is gratifying to me that the legacy coursework is still available as it has vital knowledge which more than helps in motivating you and helping you understand the important principles in Simpleology and teaching you about yourself, how you tick and the world around you, as well as education for business/life skill sets The new taining and education in Simpleology 5 has surpassed my expectations, is unique, down to earth and enjoyable, as is Simpleology itself..
Congatulations Mr Joyner, you and Simpleology are going from strength to strength and I for one am more than pleased and feel priveliged and excited to be a part of the community. Having a new career and training to be a nurse. Having a small online business and building a website as a hobby. Having a beautiful and productive garden. Affording two very good telescopes to achieve a dream of studying astronomy. And best of all, being a better father to my children and having the skills, energy and motivation to educate them in the right direction and to be a good example to them. Thank you most sincerely Mr Joyner, your email and of course Simpleology were prime motivators and vehicles for this amazing change in myself and my life. Slowly but gradually I got there. Simpleology 5 is far better than I had envisaged and will now take me to my ultimate long term goal faster and more efficiently. I do not see myself as an avid fan only, but a devoted and happy member of the Simpleology family. Kudos to you and your most wonderful, caring and efficient team. See you at the top of the ladder. Getting the system to be usable is 80% of the value of the design. Getting someone to use the system is 80% of it’s effectiveness – however brilliant the design. I think Simpleology has nailed the design (and yes, there are more features to add of course). Simpleology 5 will help users up the curve to getting the most out of it, whatever their subscription level. It will also help people to understand and appreciate the benefits of the features and processes in Pro and Elite subscriptions. I look forward to it. I recommend it! Wow, I must say I am enjoying this update. The training model and belts system is keeping me on target better. It’s harder to wriggle out of focusing on DTP and easier to funnel energy into accomplishing things. Since I won a lifetime of Elite, which I am really grateful for, I have found that the Simpleology team’s focus has only gotten better, not resting on their laurels, and in order to keep up, I’ve had to be in my “zone” and positive more consistently, which as Mark says in the training, you might as well be to get more done and enjoy the process. When I get bummed and off-track, I know the system is there to record my needs in Dreamcatcher, and it’s become a crucial to keep me and my life going strong. The update is ROCKING, @Mark Joyner! Love the … need I say? … extreme simplicity you’ve now built in. Even better — the stick. Staying with it and on top of it. Can’t wait to dive in more but I can already clearly see you have outdone yourself — again! oh and one last thing stop reading this comment and “Do Today’s Training” I know I did. I love how simple it is. Good job guys. sounds very interesting. looking forward for the new features . I had the priviledge to start using simpleology v5.0 a few days before migration. It is by far the BEST I’ve seen from Mark (and trust me, that’s saying a lot because I’ve been following him and using his stuff for over 15 years).Not only Simpleology v5.0 is easier to use than previous versions, but it has new tools to help you become more effective at everything and maximize your productive streaks exponentially. I like the “belt” ranking system because it motivates me to reach futher all the time. I have been recalcitrant about my Simpleology programme, even though, as a very early subscriber to the first programme, I was convinced of its value. I commit to letting you know in six months time exactly how I have measured up and the behavioural and productivity changes experienced. I’m in v5.0. It’s amazing everyone. Amazing. You Know What? I am dying to try this Simpleology v.5. My thought is: it could do the trick to get me on track every day instead of 1 day, once a month, if lucky. Doing basically nothing, my rewards have been huge with Simpleology. I lost my life and a billion dollar company in to a Predator Bank and a couple of Preditor Partners. All my fault is the way I see it.. It took me to long to move on and recover. My fault is the way I see it. If I used Simpleology every day the fact is it is clear that I would have recovered in 3 to 6 months. Not 5 years or a lifetime to actually get to what what and where I am now. Shame on me and I mean it from the bottom of my heart. Just think how my dependents and family suffered and shame on me. ” A student in self control who has not mastered 1% even (in my humble estimation) by far of simpleology or life or anything. This student does understand one thing though…IT IS… all about what YOU / ME / I (finally evolving to I) I can change in myself. NOT, what we or I can change in others. That is unless your the coach.” Simpleology and Mark are my main coach. There are others but this is where it is all at for me. Awesome. Glad to see the training module back! The training looks great, but it isn’t accessible to deaf people like me. Could you add something such as subtitles (possibly with an option to turn it on and off)? Subtitles should ideally be white on a dark highlight for maximum visibility. I’ll mention that I really liked the comics in the leadup posts, BTW. They were easy for me to understand and follow, so that’d also be a viable alternative. Though I suspect subtitles might be easier and cheaper to implement. @Mark Joyner @kajarainbow Thank you very much for the positive response! That really helps. I’ll be sure to let you know how readable it is. And is there any way I could get my training progress reset so that I can rewatch the first video with captions once it’s done? @Mark Joyner Sorry for the late response. I was putting it off–the exact thing I needed Simpleology to help with. But now I’ve gotten started and will work on keeping it up. I found the captions to be perfectly legible and easy to read. They were an enormous help in understanding the material. Thank you so much! @kajarainbow Excellent – very glad to hear that! Over a week ago I was chatting with Mark Joyner about the new Simpleology that was being released and he invited me to take a sneak peek at it. I was pretty excited about it (big fan of Mark’s for long time) and told him I was super busy for the next couple of days due to a launch, so I would check it out on X day. His response was, “Busy? That’s what we’ll help you with.” The past couple of days I’ve really been in there checking things out and I have to tell you, Simpleology is LOADED with TONS of stuff to help you GET STUFF done! There are tools to help you start your day, stay focused, recurring tasks, even stuff to help you keep track of calories if you’re on diet! Daily targets for yourself/business, a dream catcher, which has some pretty cool features that you can access right from your browser. Delegation station to designate tasks for yourself or your team and a vision board of sorts (haven’t looked at it too much in depth yet, but looks cool). If you don’t have a Simpleology account, I HIGHLY recommend that you get one especially if you keep finding yourself getting lost trying to accomplish things! Definitely one tool I’ll be putting a lot of use into this year. Mark and Team, I’m loving this! It’s been 5 days now and I can see that in another week or so I’m going to be a total Simpleologyhead! Getting deeper into it and more and more familiar with what you’ve created. The interactive real-time-do-it-now daily training is going to turn me into a user that finally takes advantage of EVERYTHING that’s available for all of us to be VERY productive and efficient human beings. And I just noticed you added the new check boxes on the left side of lists for ticking of completed tasks as well the ability to move and sort effortlessly. You guys are always tweaking to make things better and easier and it’s so appreciated. It’s great knowing that as much as I like it now you guys are continuously adding value. Again thank you for this. I’ve come and gone with Simpleology over the years but there’s no going anywhere now. There’s just nowhere else to go. @RichardL Thanks, Richard – glad you noticed the changes to the options overlay! The crew is working on stuff like that all day every day. Just wait till you see the new stuff coming out over the next couple months. We’re about to crank it up a notch. Thanks so much for Drag function! Very time-saving function! There must be more you’re developing I’m sure @MarkJoyner !!! @NikolaKindRad Thanks, Nikola! Yep, the team is hard at work on new stuff all the time, but what we have planned for the next couple months is going to be pretty spectacular. Looks like I joined this revolution at just the right time. I just found out about Simpleology a few days ago and I’ve really been using it. I already see a difference. And I LOVE the training. Thanks for making this system! Dear Mark and all the team at Construct Zero. Thank you so much for Simpleology 5. I’m loving it so far and am committing to stay with it. Keep up the great work. More later. @ Its a wonderfol journey , well need some very useful time to study and get premium results. How many times do you have to do the training before you can get the white belt? Start my day is essentially the same as earlier, and I already know how to use it. Do I still have to watch the whole training video everytime, even if I know how to use it? I can’t even forward the videos(cheating I know)…I can’t wait to try some of the other stuff Simpleology 5.0 has to offer, but so far I feel like I do much until I get the white belt. @deeshakc Hey, the number of times you have to do the training is pretty high for White Belt. Later belts will require about half as many, but the stuff you master in White Belt is so important that it merits a lot more repetition. That said, the number for White Belt is 20. It seems like a lot, but any fewer and we run the risk of folks not actually building the habit. For someone in your case, I wish I had a better answer, but we really need to have a way to ensure everyone experiences enough repetition to build the neural pathways of the habit. The plus side is that there may be a few nuances of the system you have missed that you can pick up on in the training. Plus, it never hurts to spend more time on the basics. @Mark Joyner @deeshakc Mark – Fair enough on building the habit. Is there some way to add in a way to do a little more? I was thinking this morning while the white belt thing was running…Man – wouldn’t it be cool if after I finished this thing today I got some sort of prize in the form of extra training? Like a bonus video that I had access to where I could learn a new Simpleology skill. I’m 45% through the white belt. I’ve figured out how to use the recurring tasks, but they won’t show up in training mode. So I go through Start My Day again after the Training, just to capture them. @Kendra Grant Hey Kendra, great to see more educators here. We’ve been thinking about how to handle this. It’s a bit of a lower priority as the next belts will be shorter, but we are considering several ways to address it. The one I find most interesting so far is the inclusion of a few intermittent quizzes to show randomly at appropriate times. It wouldn’t shorten the training, but it might give enough random variation (and random payoff) to counteract any sense of monotony. @Mark Joyner @deeshakc :) I’m really looking forward to Yellow Belt training! What I’m hoping for is at the end of a _daily_ White Belt (before the 20 repetitions are up), some kind of extra learning. For instance, at the end of a day of White Belt training, there’s an option for me to learn a little more about Simpleology (before getting to the next belt). “Do Today’s BONUS Training” Still require the 20 days of White Belt, just add some new stuff to keep me engaged. I’m an educator too; if I met with a student every day and repeated the exact same thing to them for 20 straight days, I’d lose them quite quickly! I adore Simpleology and tell everyone who will listen how it’s already made a huge difference in my ability to get things done. The small amount I already know has kept me from losing hundreds of dollars. I know I can do more with it – will you please help me do that? @tessfisher @deeshakc Hi Tess, thanks for the feedback. I think the intermittent quizzes might just do the trick … Let’s see if that has the intended effect of added variation.Beyond that I’m reluctant to add additional work after the training each day as I want folks to get right to hitting their targets – which is the real point of what we’re doing. Although I am not who the training is aimed at as a long time user, I have found that, after 5 times repeating the white belt training, I have started to feel negatively about doing it. As a result I have started muting the audio and doing other things while the videos are playing. This is most likely because I do get Simpleology already and primarily want to just see what is presented at the higher belts. But I think even if I was a beginner to Simpleology I’d be doing the same thing. After 5 times I feel like I would have got it already. The thought now of doing it 20 times is a little bit exasperating which is probably not the feeling you want to leave people with. Could this be a problem that prevents users who learn quicker from engaging more fully intellectually and emotionally with the system? How about this as a way to gain a happy medium: Force the training 5 times (maybe 10 if need be) but then put a skip button on the videos. We could skip a video or watch it depending on what we think we need. I think giving *some* trust to the trainee to do what’s best for them is helpful while at least forcing the bear minimum repetitions (what is it, 5 to 7 times hearing something before it goes in?). I don’t think it would be so bad to do it this way as the very act starting the video, once a person has seen it a few times, will trigger the memory of it, reinforcing it, and it’s not always necessary to watch the whole thing all the way through to do this. On another matter, having got to later belts, is it possible to return to earlier training if we think we need a refresher? @Mark Jones @Kendra Grant Hey, solid feedback. We’re working on addressing all of this now. Not only are we going to include the quizzes, but we’re also going to make the White Belt training in two flavors: full days, and short days. Full days, where you see the full videos including the long intro, will occur on Days 1, 2, 6, 11, 16, and 20. The rest will be short where you won’t see a few of the videos and a shorter version of Video 3. @Mark Joyner Thanks Mark. I should have prefaced that my comment wasn’t meant to sound like a gripe—just looking for possible improvement—but I’m glad you already knew that. Will be interesting to see how that works. Will there be a way to retake old belts / lessons once people move on to higher belts? @Mark Jones Hey, coming from you I didn’t take it like that at all :-)As for re-taking the belts, I wasn’t planning on it, but you’re right – that would be handy … Let me see how easy that will be to do. @ProjDoctor @tessfisher @deeshakc We’re rolling out a change in a couple of days here where we have Short Days and Long Days. On the short days the videos will be – well – short. @Mark Joyner @ProjDoctor @deeshakc HOORAY!!! I’m looking forward to seeing the change! It will be easier to get through now. I’ve also been putting the mute button on and doing other things while the video runs. Then I run start my day again without the training mode so that I can capture the recurring targets. I am beyond excited by this enhancement, Mark (and Team!). Thank you!I adore Simpleology and am fully committed to using it. After just a few weeks I can’t start my day without it. I’m so glad I went with Elite! I like this idea. I have to admit I let the videos run and did something else. If white belt is just the repetition of the three actions (dreamcatcher, start my day, daily tasks) then the more you can shake it up (talking head, screen capture, examples) then the more likely people will stick with it. I’m both an educator and also own my own professional development company. We create instructional videos around technology so I know how tough it is to make videos (having made 500) but I think this would recreate repetition without it seeming repetitive. Hey, I just clicked the training and it looks like you’ve already made some changes! I’ll check them out. @Mark Joyner @tessfisher @deeshakc Hi- joining the conversation late here but just signed up today. I love Simpleology! I’m so excited at the thought of becoming super-productive, that it made my whole day. 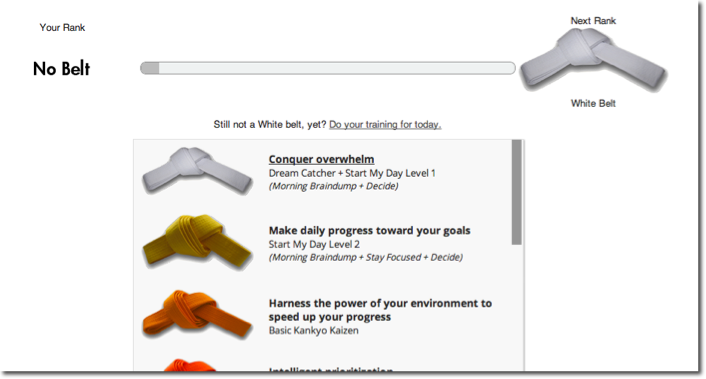 Re: what to put in the White Belt Training- Love the gamification of the training. I’m also an educator (LD and special needs), who dabbles in instructional design, why not add a short interactive learning module that focuses on some of the theory behind Simpleology? I know that there’s also the library, but I’m sure that plenty of people don’t get through everything there. Instead of making it quiz style, you could create an imaginary person (comic book style), tell us what the problems are that they face, and as the test, let us organize everything Simpeleogy fashion. If we get it right, we win. If not, then we are redirected to the videos or library content that has the right answer. I like that I can skip though the videos on later days now giving the option to watch what I want to if I need a reminder (I end up watching the short ones anyway – it’s no hassle really). And by the time a person has gone through the short videos a few times we will absorb in the longer ones much more effectively because, while repetition is good for memory, repetition of the same frequency and type makes you actually tune out. So I actually quite like looking at the long ones again after taking a break from them for a while (that’s why I would actually like to be able to go back to the earlier videos even if I was on black belt). I think we, as long-time users, have to remember that this is designed for newbies really so it will seem like too much repetition for us, but that we can still benefit from some reminders and reinforcement. @Mark Joyner Also I totally get why you don’t want to add all the modules into White Belt training as that would probably overwhelm a new user (though I do miss the prioritization module and the recurring tasks - I feel like there should be a little something at least about clicking and dragging the tasks into order in White Belt). Cheers for all the hard work, Mark and Team. @Mark Joyner I forgot to mention, though I wanted to when I first saw it, I LOVE the new redesigned overlay. Just a little change really but it makes a massive difference to productivity (this is from someone who started out a tiny bit skeptical about the overlay when I first saw it). @Mark Jones Music to my ears The good news is, once you’re up to Black Belt there wil eventually be more training that should be totally brand new to you. And soon you’ll be able to tout your skills with the certification. @Mark Jones You will see Prioritize again very soon Will be very interesting to see how a power user like you is affected by the whole process. You’re a rather special case, of course. You’re one of the folks who are probably already Black Belt without having gone through the process. @Mark Jones Thanks! Yeah, we’re announcing that and some other handy new features today. @Mark Joyner Thanks for the detailed reply Mark. It is so nice to see you reply to each of our msgs, determined to make Simpleology sth tailored for us. Thank you so much. Also, I loved the new look of the Simpleology 4.0 and of course now 5.0 and can’t wait to get to other belts. Also very glad you made video tutorials. Sth that was missing in 4.0. Thanks so much for helping me achieve my daily tasks and long term goals. Keep up the great work. @deeshakc You’re most welcome We have some even more interesting things in the works right now. Can’t wait to show everyone! While I praise simpleology for their concept, product, interface and design, I must voice my admiration and discontent at the training. The training is fantastic in the guided design. I even don’t mind 2 or 3 iterations in order to have the process. It is clear to me, however, that the 20 repetitions of the same training, “short version” or not, is contrary to what we (simpleology and I) are trying to achieve. At only 5 training days, I have built a bad habit of muting the speaker and, what’s worse, I no longer go through the steps in detail. After the 1st 2 or 3 times, I view the training and insulting. As a long time user of simpleology (past account), I activated my account again because of the effectiveness of your product. I was overjoyed to go through the training the 1st time and very much looking forward to future trainings. Not anymore. Now I am only obsessed with “suffering through” this repetition in any way I can just to reach the next bit of information. I am quite familiar that it takes 21 days of the same process to form a habit. But ask yourself this: If you have the habit already, could you go through 20 iterations of the same training? If the answer is no, the process needs improvement. When I read that there was a short version, I was intrigued, but on day 3, I found the short version quite long. The biggest issue for me, however, is the interruption. My “flow” is interrupted as I have to watch a video telling me what I am about to do. Now I no longer want to do it. Yes, I am not forced to do the training, but the 1st time was so effective! Please take this commentary in the positive spirit in which it is sent. Simpleology is a fantastic way of relieving the burden of excess thoughts preventing my from focusing on my priorities. In short, the 1st (and even 2nd) vieweing of the video helped bring focus to your product. The additional repetitions, only seem bring clutter and frustration. I’ll let you know how it is after the 20th (If my desire to see the next lesson is greater than the frustration of someone telling me what I already learned. Thank You for your time. @javierunzueta @deeshakc Hey Javier, we’re actually releasing a new modification in a few days that will allow you to fast forward through the videos after a few repetitions. You’ll still need to go through the process, though, as that will demonstrate to us that you have the skill/habit built in enough to go on to the next level. Since eventually people will be able to use their certification level as a credential, we do have some responsibility here to ensure folks have acquired the skill enough to attain that rank. If we don’t require demonstration and repetition, we can’t really offer that responsibly. Hope that helps. @Mark Joyner @javierunzueta @deeshakc What is the certification you mention? Wow I am back in school again. Thx Marc I love your program! In fact I love so much that I decided to promote Simpleology in the Netherlands. I am building a platform online to help local business in the centre of Holland develop their business. We will cover about 100 subjects and we will closely work with expert on each area. In a few months I expect to report some serious results and create a large following for ya! You have turned me on to online affiliate marketing after I studied your course. Thx for the inspiration. It’s Wednesday 1st of May here in Australia and I felt the need to share with you all that I have completed my white belt training. I have been a long time user of Simpleology, slow to start, and then every day with Simpleology 4. I found the training reinforced my habit of starting my day with Start My Day. Instead of needing willpower to do it every day I now can’t start my day withou it. Looking forward to the yellow belt training. I can’t start my day without Simpleology. Spending that little bit of time in the morning has made me more productive than I’ve ever been and I’m super organised and have found my attitude and overall wellbeing improve. You have created a pwerful tool Mr Joyner and it’s continued improvement just makes it more powerful. I’m looking forward to all the comming changes and enhancements. @Branimir Now that’s the kind of message on which I like to end my day Thank you for the kind words – and please know that all praise should go to the entire team here. This is not a one man act by any stretch of the imagination. It takes a tremendous amount of work from some very talented people to make all this possible.Yellow Belt is interesting – and important, but things will get *really* interesting around Orange Belt and beyond. @Branimir Now that’s the kind of message on which I like to end my day Thank you for the kind words . It takes a tremendous amount of work from a very talented team to make all this possible. Yellow Belt is interesting – and important, but things will get *really* interesting around Orange Belt and beyond. @Mark Joyner I would like to take the opportunity to thank your extraordinary team for all their hard work. They are efficient and obviously dedicated. The support staff are very polite, positive and cheerful and the technical staff have done wonders for me. The issues that came up were resolved promptly and efficiently and with such a positive and cheerful friendly way. I am benifiting more and more from Simpleology as a whole and am still progressing through all the Legacy coursework as for me personally I find it to be invaluable education, with some real pearls in the elective courses. That is just me, I am of a curious nature and love to learn. @Branimir :D I finish my white belt tomorrow! How’s yellow??? Congratulations tessfischer! White Belt does take a little patience but is well worth it to instill such a positive and productive habit. Yellow belt training introduces the beginnings of the true Art of Simpleology. To focus your Daily Targets on the things you really want from life and from yourself. It keeps you on track every day so you can accomplish something productive that brings you closer to your aspirations. It is excellent. The lesson is shorter, succinct and doesn’t go as long as White Belt. But still gives time to ingrain it as a habit and to refine your ultimate life, long medium and short term goals. I can see the progression towards more and more interesting and exciting lessons as time goes on. It keeps me in such a positive and excited frame of mind. It’s the same with learning anything worthwhile. You have to learn your times tables before you can do any Math. You have to learn how to stretch and exercise before you can be athletic. You have to get to know each other in a relationship before the fun starts! Keep up the good work tessfischer, it just keeps getting better and better. @tessfisher @Branimir I’ve been on yellow belt for 4 days now and it’s been a massive leap forward, far more than I imagined possible. You’ll love it! @Branimir congratulations!! It is a wonderful–and spiritual thing, eh oui!–to assume one’s power and then use it for good loving, of which taking care of oneself is one of the first on the list–and makes, I have found (at last!!! ; ) taking care for others truly possible and well done.. What have yo found? because, Branimir llaouen, your success adds wonderful energy also to us all, and then the world itself. Mmm, not bad for a bit of scheduling! Thanks again Mark and team for your exquisite work on all this and the gift that you all give us as well. I’ve been trying to use Simpleology for YEARS! But I just could not stick with it. That seems like it might be changing with this guided process. I sat down at least a dozen times since it’s early days to try and get started with all the various things to fill out and etc. But I could never stick with it. I often found my self stuck, sometimes, literally in a day or two. Or confused, especially with the short-, mid- and long-term target things. My mind wanted to go one way, but the Simpleology system was going another way. It just did not flow for me at all. … That really bothered me, but could not get myself to use the system, even though I kept thinking it would be great if did. Now, for the first time, and since the steps are just **Here, do this, now do that. ** I’m just trusting the system and going with the flow, not pushing ahead on other features, and it is starting to work. And I have No Problem with the 20 times repeat thing of White Belt. … It is probably a very good idea. Right now, the only thing bothering me is scheduling stuff during Start My Day to a separate calendar. That messes with my head. I really hate having to muse multiple systems. … So I cheat. I’d much rather have a button or something to schedule it over the next few days WITHIN SIMPLEOLOGY, and not have to go to another calendar. I have a BUNCH of very nice calendar systems. But I just forget about them. I go for days without even remembering to look at them, even the really nice ones I’ve got that sit right on the screen! It’s like a mental block I developed years ago. But if I keep Simpleology open in the browser, it’s easier to remember because I keep stumbling across it. And the interactive nature of it helps, too. The belt thing is a bit of a positive challenge, too. And reading your history in the Simpleology book was like reading my own history, except for the military part. But that was not so much a how to book. But it kept me fascinated with Simpleology … from a distance. And the success part, unfortunately, that you’ve done so well with has totally eluded me. Hopefully, that is in process of changing right NOW, and maybe Simpleology will help me stay on track. Thanks for all the great work you’ve put into this, though, even in spite of my past resistance. @dsl1 Your calendar quandary makes total sense! Here’s a great option – Instead of clicking “do it” try clicking “deliberate it.” The KEY: when the task moves to the bottom of the screen, you can put a reminder date in. Then it will come back up for you when you Start My Day on the reminder date. It’s worked like a charm for me. Not quite as good as a full calendar where you can look out a few weeks to see what coming, but at least I’m able to clear my Daily Targets and have a sense of being done.Even though I find 20 times of the same thing without learning something new excessive, I too love the walk through training. It’s one of the things that drew me to purchase Elite. I finish my white belt tomorrow and am soooo looking forward to new skills! Thanks to Simpleology I’ve made more progress in my business and gotten more done around my house than ever before. I’m sure within six months this program will positively affect my bottom line. :) Yay! @Mark Joyner @dsl1 OMG, Mark! That rocks! I have 50 reminders set right now, so that feature is fantastic!!! Thanks for sharing! Hey, is there somewhere that we can look for new updates? @tessfisher @dsl1 Right here on the blog Lots of new stuff to talk about soon once the Simpleology 5 roll out is complete. @Mark Joyner @dsl1 So I’ll just watch the posts then! :) After I finish my Daily Targets…getting back to those now! @Mark Joyner @tessfisher Thanks Mark, I’l look into how to use that today! @tessfisher Thank You Tess, will try that today! … I’m only less than half way to Yellow belt, so I’ll have to wait on the new techniques, but I’m a patient guy. … And things do seem to be getting done better now. Thanks Again! Great post that covers many questions many of us (sic!) have had… Thanks for your honesty and clarity! and yes, that reminders button and clear list I just found today is grrreat! Hey there! Does anyone know how to search for something within Simpleology? I am looking for a link I saved using the omnibox. It’s either in my archived tasks or do it later. When I searched the blog I found a link to a Mental Lockbox, but I don’t think that’s in 5.0. (Could be wrong though!) Any help is appreciated! @Mark Joyner Thanks for the speedy reply Mark! All my lists are the same color. There are lots of lists, just all the same color. 5.0 is my only experience with Simpleology and there’s nothing called Mental Lockbox that I have found. I can send your team a screenshot if that would help. Wait, maybe you mean the little icons. ? It’s not that important. Just confusing when I search the blog and find past versions with information I want to use (like search!). Looking forward to asking you the search question again! Hey guys I cant find the My Account section to add my mobile number to use the SMS -> to DC feature. Any guidance, please? @CraigMurray Hey Craig, look for “Accessories” in the upper right corner. Yeah, this isn’t as intuitive as it could be. @Mark Joyner @CraigMurray Ok found it but I cant get it to work @Mark Joyner does it work for us down under? It hangs on retrieving the code. @CraigMurray It’s altogether possible you’re using a carrier that is sending some garbled code to us when we try to authenticate. We were just talking about that this morning. This should be resolved for *all* carriers in the next week or so. We’re starting a round of improvements to this feature today, in fact. @CraigMurray How you enter it is unlikely the problem since we detect your number when sending the code anyway. I’m almost certain it’s garbled code from your carrier. Hang tight and we should have this cleared up in two weeks at most. This is important because we’ll be boosting the functionality of this option shortly as well. Frankly it will make having a mobile app for Simpleology almost totally unnecessary. My friends are you fining logo! On the internet first impressions count and that’s likely to be your business is your logo.